Oil ExTech, a company founded by engineers and retired HP employees David Hackleman (Ph.D.) and Bill Dean, offers a sustainable and cost-friendly way for the public to extract their own essential oils using a microwave extraction kit. The kits run at around $150 and are available for purchase at the Oil ExTech website. Essential oils, known mainly for their healing properties, are often expensive and rarely found naturally. An at-home steam distillation often takes around 4 hours, where as the microwave extraction takes as few as six minutes. The materials used with the Oil ExTech product are also machine washable, making clean up much more convenient. This, is where Hackleman and Dean’s inspiration and motive lied when founding Oil ExTech. Research regarding the microwave extraction of essential oils has been ongoing at Oregon State University since about 2006 by graduate student under the supervision of Dr. David Hackleman. Microwave assisted steam distillation showed promise with increase in yield, quality, and using less energy than conventional steam distillation. Most people are concerned that microwaves damage the oil properties however the microwave energy specifically targets the water molecules and don’t affect the oil. Also due to the quick distillation time and low pressure the oil quality ends up higher. In about 2009 Bill Dean led a team that began to work on microwave extraction of oil from oil sand. Dr. Hackleman was the advisor for this team. They did many experiments, yet concluded that the microwave process, already being pursued by major Energy companies was not an avenue to success. The first method utilized by Dr. Hackleman’s team relied on developments in fluidized bed reactors and analytical microwave extractors. This method of microwave distillation required that a hole be cut in the top of a microwave where the steam would exit and be cooled through a condenser. Clearly, this would be unsuitable for a product aimed at the home and modestly equipped laboratory. After Hackleman and Dean faced woes with developing a suitable home microwave distillation system, they decided to start development with a team of new students and ex-HP employees. With a pool of fresh minds and ideas, Hackleman and Dean began to see real development on the project. Dr. Hackleman proposed the suggestion to shield ice to create a condenser inside the microwave oven, but the team did the difficult development to make that idea practical. The entire team, with their creative ideas and development of the fundamental concept of shielding of microwave energy played a significant and fundamental role in developing the patentable concept we are utilizing in our device, and share as inventors. They developed a system which shielded both the ice and the condensate, thereby creating a condenser that would be able to operate in a normal home microwave oven safely, and with no hole. As the once idea of OilExTech was becoming a reality, Hackleman and Dean approached Jonathan Lebsack, one of Hackleman’s graduate students working on large scale microwave distillation, about joining the team and working on experiments to help optimize oil yields. After Lebsack graduated with a masters degree, the three applied for a provisional patent and began a small business selling the brand new technology. Jonathan Lebsack explains that the motive behind starting the company was bringing a brand new technology that is typically too expensive, complicated, and difficult to do at home simple and fast. Typical steam distillation processes can require up to 4 hour distillations while the OilExTech product only takes 6-8 minutes. There are also no moving pieces on the product and cleanup is quick because everything is machine washable. The OilEx Tech EssenEx-100 runs at $150 and allows for at-home microwave distillation! The process also utilizes sustainability in the sense that it is more energy efficient than other oil extraction techniques seeing as it uses electricity can be powered from green energy. The oils made are generally local as well. In the northwest, great plants that have extractable oils are abundant. Peppermint (other kinds of mint as well), lavender, rosemary, juniper, and citrus peels all can be found locally and easily made into an essential oil. The product can be used for educational purposes to teach steam distillation labs, for research by obtaining quick samples for analytical testing, or for home use. The uses of essential oils range from crafts like candle, soap, lotion, and aromatherapy to things like medicinal, culinary, and insecticides or it can be used to determine oil composition. OilExTech offers two basic kits that include everything you need to start distilling essential oils at home. 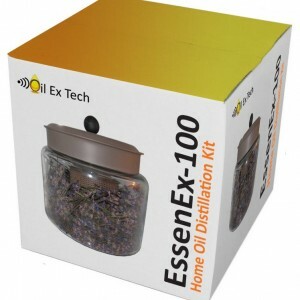 The kits include all of the materials needed to begin an at-home Oil Distillation process. Similar sized steam distillation kits cost up to $800 and microwave distillation system can cost up to $10,000. They can be purchased online direct or from one of the OilExTech distributors. While the developers do not have a store front local pickups can be arranged through email.